The range of open boats produced by the Manò Marine yard was recently extended to this new Manò 22.50, a comfortable and practical motorboat with central dashboard, perfectly balanced design and low grabrails. The boat was designed with interesting solutions: the forward and the aft cushioned sunning areas are fitted with a bumper-like surrounding belt, the galley is located under the pilot's settee, the aft swimming platform is fitted with the swimming ladder, a special awning is installed, etc. The boat is designed so as to take advantage of all spaces. The helm station includes a strong settee for two persons protected by a smoke-gray windshield and it is fitted with all necessary instruments for engine control: compass, switch panel and extra space for electronic instruments. A grab-rail would be useful. At sea, the Manò 22.50 is very maneuverable, reaches planing speed very quickly and has a pretty good top speed. Because of calm sea conditions during testing we could not verify her seakeeping abilities in waves, nevertheless, she behaved very well in the wake of other boats. Draft from lower tip of propellers: 1'4"
Total engine weight: 406 lbs. 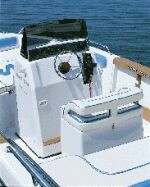 Price with standard equipment and test boat power: Lit. 37.000.000 ex VAT. Deck and cockpit: full shower, navigation lights, electrical plant, bilge pump, 500W Lofran windlass, awning, fuel level gauge, cushions, table kit, switch panel, Bruce anchor forward fitting and battery.